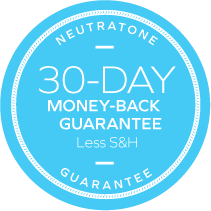 Neutratone is a leading skincare company with customers internationally. Protecting consumer privacy is of utmost importance to us. We are committed to safeguarding our customers’ personal data. Personal Information means information that (1) is recorded in any form; (2) is about, or pertains to a specific individual; and (3) can be linked to that individual. – Ordering Online: When you create an individual account online at www.Neutratone.com, we may collect a variety of information, such as name, mailing address, email address, phone number, and credit card information. – Phone/Fax: When you call Neutratone’s Customer Care/Third-Party Partner for consultation on our products or ordering products, we may ask and collect information such as your name, mailing address, email address, phone number, and credit card information. Neutratone will only use your Personal Information for purposes relevant to the manner in which it was asked. Neutratone may use your Personal Information to provide you with services or products being purchased. Neutratone may transfer your Personal Information to companies that are performing services for Neutratone. Neutratone may also use the information you provide us to help personalize product information and offers. We only use your name and mailing address information to mail you promotional items, news and offers. We will never give or sell your user information or email address to anyone without your consent. Neutratone allows individual access to their Personal Information and al¬lows the individual to correct, amend or delete inaccurate information, except where the burden or expense of providing access would be disproportionate to the risks to the privacy of the individual in the case in question or where the rights of persons other than the individual would be violated. You may review your Personal Information by contacting us using one of the options below. You may also choose to opt-out of email alerts or deleting your Personal Information from our systems. Neutratone will keep your personal information only as long as we need it for the purposes for which we collected it, or as permitted by law. When the data is no longer needed, Neutratone will use reasonable measures to perform secure erasure of data. To ensure compliance with federal law, Neutratone.com does not maintain information provided by children under the age of 16. If you are visiting Neutratone.com from a location outside the U.S., your connection will be through and to servers located in the U.S. Your orders placed through Neutratone.com will be accepted and fully processed in and shipped from the U.S. and all information you provide will be securely maintained in our Web server and internal systems located within the U.S.
Neutratone takes reasonable steps to protect our customers’ Personal Information from loss, misuse and unauthorized access, disclosure, alteration and destruction. Neutratone has put in place appropriate physical, electronic and manage¬rial procedures to safeguard and secure the Information from loss, misuse, unauthorized access or disclosure, alteration or destruction. Neutratone believes in providing a safe and secure shopping experience for all of our clients. We provide stringent and effective security measures on our website. We designed Neutratone.com to accept orders only from Web browsers that permit communication through Secure Socket Layer (SSL) technology. This means you’ll be unable to inadvertently place an order through an unsecured connection. Customer Personal Information on paper are shredded and disposed of securely when no longer required. Where required, customer Personal Information on paper are kept in locked filing cabinets or stored off-site in secure third-party managed facilities. Customer Personal Information kept electronically is protected by access controls such as strong passwords and the worldwide standard encryption AES-256. Neutratone also maintains systems that are physically secured and logically secured by firewalls and other security software (Anti-Virus, Intrusion Detection Systems). Neutratone’s systems are continuously patched for vulnerabilities and validated by external third parties. Customer Personal Information transmitted over unsecure networks (public internet) is always encrypted with strong AES-256 encryption and only with trusted external entities (ie Third-Party Providers that take/process customer orders). Neutratone uses a self-assessment approach to assure compliance with this policy and periodically verifies that the policy is accurate, compre¬hensive for the information intended to be covered, prominently displayed, completely implemented and accessible and in conformity with the statements. We encourage interested persons to raise any concerns using the con¬tact information provided and we will investigate and attempt to resolve any complaints and disputes regarding use and disclosure of personal informa¬tion in accordance with the statements. For your convenience, our website may contain links to other sites. Neutratone.com is not responsible for the privacy practices or the content of such websites. We will share personal information if we have a good faith belief that access, use, preservation or disclosure of such information is reasonably necessary to satisfy any applicable law, regulation, legal process, such as a court order or subpoena, or a request by law enforcement or governmental authorities. In accordance with our commitment to protect personal privacy, Neutratone adheres to the principles of the Safe Harbor Framework as developed by the U.S. Department of Commerce in consultation with the European Commission.